In the period of time between March 16 and June 9 2015, the Assad regime in Syria conducted at least 23 air raids. Forty six chlorine barrel bombs were dropped in the province of Idlib, with over 500 Syrians affected by exposure to the Chlorine and tens of deaths from suffocation were recorded by the UN. Recently, ISIS has repeatedly used IED’s and mortars filled with chemicals, against opposing Kurdish, other forces as well as against Iraqi and Syrians civilians. Mr. Brennan, the CIA Cheif, acknowledged on the CBS program 60 minutes that artilary shells with chlorine and mustard gas are avaliable and have been used by ISIS. These facts support reports that ISIS has begun to adapt suicide bombs and IED’s to include chlorine and other chemicals. ISIS may begin to further exploit the use of chemicals as it develops new weapons and captures new Toxic Industrial Chemical. TIC, production or storage sites in Syria. Tasks such as fighting, rescuing people, providing medical care or protecting people become unmeasurably more difficult, if they have to be done under a cloud of toxic materials. Thus, early detection of potential exposure to toxic chemicals and the identification of the specific TIC used, can greatly reduce the number of casualties and the severity of their injuries. This will also help find the best way to manage the situation and simplify subsequent decontamination activities. Presently, CBRN teams often use detectors for TIC and warfare chemicals, based on IMS (Ion Mobility Spectroscopy) or MS (Mass Spectrometry). Hand held and back-pack versions of these systems with prices that the range from $33,000 to $70,000 are available. These detectors are cumbersome, expensive to maintain, require specialists and well-trained users, in addition to a power source and time to power up and power down. These detectors often produce false positive identifications and thus require frequent calibration and expensive specialized sub systems such as databases and reference materials. Many of the functions of the present detectors can be performed using small, light-weight low-cost non-electronic detectors for TIC. In fact, certain tasks can be performed even more effectively using the small TIC detectors. The small TIC detectors can be used by CBRN, HAZMAT personnel and first response teams as well as by military personnel. Moreover, they can be used by minimally-trained personnel in public places such as transportation depots without creating a panic. Appealing Products Inc., API, developed and is offering two low-cost, instant detectors for Mustard Gas and Lewisite, the HD-08, and the five most used TICs, the RON™ Detector. Medical Personnel – Treating victims of chemical attacks. Commercial Companies – identify safe working exposure of many types of TIC. The RON™ TIC detection kit is a card with several spots that change their colour instantly when exposed to specific TIC’s. The size of the detector is only 4.25”X3”X0.125” and weighs 8.9 grams. (About 11.2 grams including its packing envelope). The RON™ detector requires no maintenance or power source because it is not electronic. The RON™ detector utilizes some of the principles described in US Patents 4,772,560, 4,840,919, 4,666,859, 7,503,962 and 7,553,450 as well as in several patent applications (US Patent applications No. 07/504,250 and 07/429,929 for the detection of mustard gas, HD, and G nerve agents respectively) as well as several other pending patents. The colour change can be seen visually even in dim light; this can help to react properly whether it is day or night. No reagents or droppers are required to enable the RON™ detector to work. The RON™ detectors come individually wrapped in tear-open sachets. 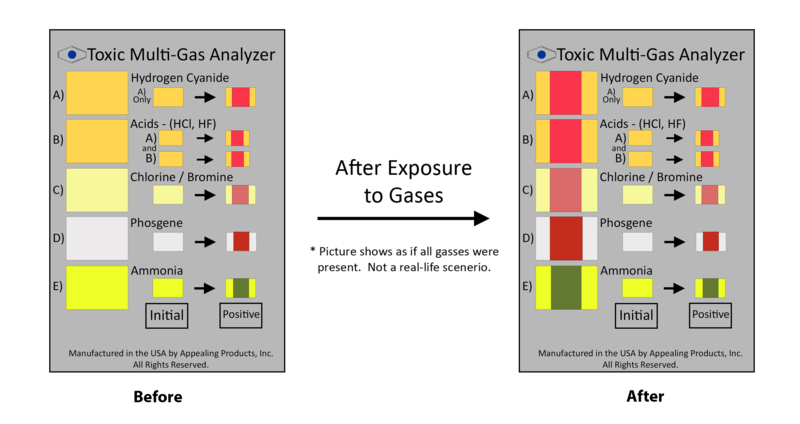 Each detector includes its own colour chart that permits an easy identification of the chemicals in question. Made in the USA by Appealing Products, Inc. Appealing Products, Inc. / ChemSee reserves the right to sell or not sell these products to any person, without reason.